This is one of the most obvious suggestions for a nightclub – not only for the indoors, but for the outdoors, too. Both seats and tables can have a glow option, and sets like these have what it takes to create a cheerful and stylish atmosphere in any nightclub, regardless of its main theme. Another great suggestion for any nightclub featuring a bright and modern decoration theme is glossy plastic. It looks fantastic both indoors and outdoors, mostly because it features shiny designs and it is possible to choose from the wildest variety of different colors. Another fabulous type of nightclub patio furniture is rattan one. Any rattan design looks very authentic in the open air, so you should definitely consider arrangement for your open site. Plus, you would probably want to make your seats more comfortable and equip them with put-on soft cushions. Another great suggestion on nightclub patio furniture is to equip your site with high gloss tables and genuine leather seats. The arrangement will look fantastic in white; however, it is also possible to go with any other shade of your choosing. Another type of table that will look great in combination with leather seats is tempered glass table. It is possible to go with tinted or transparent glass. The first one should obviously be in tune with leather upholstery; the second one is a much more neutral decoration solution. Finally, one of the classic decoration approaches is to go with velvet seats and genuine wood tables. It is unobtrusive, it is elegant, and has what it takes to fit into any environment. 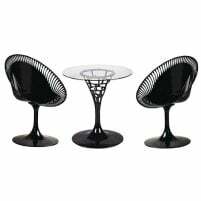 Also, note that it is possible to look for nightclub patio furniture in dedicated stores, selling furniture for professional use only, as well in some general stores, like Furniture in Fashion . The latter one is, in fact, one of the biggest UK furniture stores, offering its clients a one of a kind combination of placing orders in the comfort of their own homes and urgent deliveries of any new purchase – as if you placed an order in one of the local, on site stores. This is a truly unusual combination, and if you have ever ordered furniture online, you should already know that the delivery generally takes long – but not with the Furniture in Fashion, though.